The Oregonian reported today that the Oregon Department of Transportation and Portland State University have created a computer model that for the first time gives bridge-by-bridge estimates of the damage and traffic delay costs the next big Cascadian Subduction Zone earthquake will cause to the Oregon coastline and Willamette Valley. The computer model estimates are staggering: an 8.0 to 9.0 Cascadia Subduction Zone earthquake would destroy 399 bridges and heavily damage 621. The bridges built before 1975, before seismic standards, would suffer immense damage or collapse. Roads to the coast would be entirely cut off. While the model estimates are sobering, they provide a unique preparedness tool for Oregonians. The state can now prioritize which of the 2,671 bridges in the state highway system should get seismic upgrades. 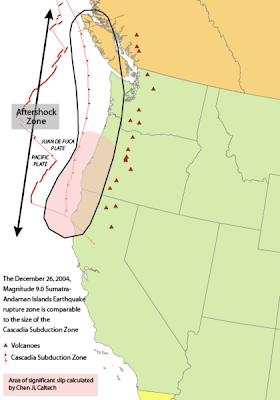 The Cascadia Subduction zone is the large 600-mile fault line about 75 miles offshore that runs from Northern California to British Columbia. In January of 1700, an estimated 9.0 magnitude quake ripped open the fault line, causing violent shaking and a huge flood; and created a tsunami that hit Japan. Researchers estimate that the region is past due for another such earthquake, perhaps within the next 50 years. When it comes, thanks to this new computer model, Oregon's state highway system will be a little better prepared. But preparedness doesn't stop at the state highway level. This computer model shows just how important it will be for individuals and families to have emergency supplies. With roads and bridges impassable, it will very difficult for first responders to reach neighborhoods to provide emergency medical services or provide food and water. You will need to have emergency supplies already stocked, enough for a minimum of three days. Oregonians, let this computer model be the incentive to prepare yourselves. It is no longer a question of "what if" but "when." Only half of Americans have emergency supplies set aside. You now have a chance and the incentive to be the other half. Buy a three-day emergency kit for your home and car here. Brush up on your earthquake safety skills here. Check out the article in The Oregonian here.